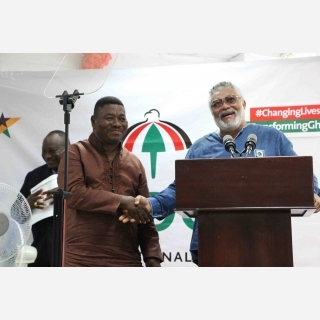 Former President Jerry John Rawlings has urged members of the ruling National Democratic Congress (NDC), particularly its leadership to accept criticism in good faith. He also wants the party to speak with one voice, saying it is unpardonable that multiple and contradictory responses from government officials to allegations against the government or party is commonplace. Rawlings was speaking during a ceremony at the party’s headquarters in Accra to mark the 24th anniversary of the formation of the NDC, at which several officers of the party were honoured. Rawlings counseled that with this year being an election year, it is natural that the incumbent government feels the heat of the criticism, being the party facing critical assessment from the electorate including himself, and an opposition feeling justified and hungry for power.Tempers may rise and angry words exchanged, but the NDC must not allow its desire to stay in power compel its leaders at various levels to descend into the gutters and contribute to an atmosphere of insecurity. We have to accept criticism in good faith and recognize the fact that criticism is the best form of praise. It offers you an opportunity to assess your weakness and better appreciate how others perceive you,” he counseled.He also said the “NDC will have to lead all in ensuring that this year’s election is conducted in an atmosphere of transparency. Ensuring free and fair elections devoid of unfortunate incidents will be a huge credit to the NDC and we have a responsibility to direct all our operatives to comport themselves during the most trying moments of the campaign and election period. We cannot win the trust of the people by putting up aggressive and abrasive behaviour. It will sour the electoral result and poison an already challenged political environment,” he said. Today marks 24 years since the National Democratic Congress was registered as a political party. The NDC was borne out of the toil and sweat of the ordinary people of Ghana, who spontaneously rose up on June 4, 1979 to put an end to the arrogance of power, massive corruption and the denigration of the people of Ghana for well over a decade. I need not bore you with the history of the AFRC and the PNDC even though there are some here who actually need a few years of education on why some laid down their lives to bring them where they are today. Meeting you all here today gives me mixed feelings. It is uplifting that the party is using today to recognize many of those who joined forces to establish the NDC. We have lost many of such personalities along the journey and some are too weak to join us here today. It is nevertheless commendable that the party has thought it appropriate to honour these heroes and heroines for the role they played in setting up this formidable political force. The party has seen significant changes and many of those who started the journey are no longer around. Their absence however does not mean we should gravitate from the ideals that necessitated its establishment – the core ideals of truth, justice, equality, transparency and accountability. The NDC has returned to power since 2009 and undoubtedly faced some major challenges including the scourge of dumsor, a global economic downturn created by falling oil prices and an unfair world economic order. We have to concede however that in spite of government’s conscious efforts to ensure that we surmount these challenges some within the party and government have swayed from the core ideals of integrity and transparency and decided political authority offers them the opportunity to push the boundaries of political decency. We need to offer ourselves multiple opportunities for intra-party soul-searching, where we can candidly look ourselves in the face and question our contribution to the success or otherwise of this political force. It is commendable that the party has opened up the Electoral College for the selection of executives as well as parliamentary and presidential candidates. As a party dedicated to grassroots participation, it is praiseworthy that registered members are now issued with biometric identity cards. I call on leadership at all levels of the party to ensure that the list of registered members is widened to embrace millions of our supporters who are yet to appreciate what it means to register officially for the party. Election of party leaders must be truly representative of the full strength of the party and membership registration should be made as simple and accessible as possible. I implore party leaders at all levels to also endeavor to consult members on all decision-making processes to ensure true participatory democracy, the bedrock of the NDC. 2016 is an election year and the media is awash with political rhetoric. Naturally the incumbent government must be feeling the heat of the criticism, being the party facing critical assessment from the electorate including me, and an opposition feeling justified and hungry to unseat the NDC. Tempers may rise and angry words exchanged, but the NDC must not allow its desire to stay in power compel its leaders at various levels to descend into the gutters and contribute to an atmosphere of insecurity. We have to accept criticism in good faith and recognize the fact that criticism is the best form of praise. It offers you an opportunity to assess your weakness and better appreciate how others perceive you. Today it is not uncommon for there to be multiple and contradictory responses from government officials to allegations against the government or party. That is unpardonable. Mr. President, Distinguished Guests, Ladies and Gentlemen, the NDC will have to lead all in ensuring that this year’s election is conducted in an atmosphere of transparency. Ensuring free and fair elections devoid of unfortunate incidents will be a huge credit to the NDC and we have a responsibility to direct all our operatives to comport themselves during the most trying moments of the campaign and election period. We cannot win the trust of the people by putting up aggressive and abrasive behaviour. It will sour the electoral result and poison an already challenged political environment.